(Other product variations are available). Thank you, you will be emailed just as soon as this item becomes available. The Rob-Nel Catheter is latex-free. 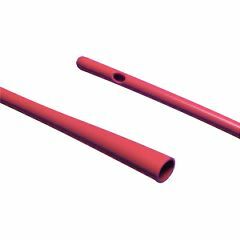 It is made out of thermo-sensitive polyvinyl chloride (PVC) material and has a smooth rounded tip, integral tapered funnel end and two staggered eyes. Best catheter that I have found to work. I use this on a daily basis. I have found it to be the best product on the market for my needs. Personal use. Like it's flexibility. Be using this product for two plus years now. Tried others found to be to flimsy. This product is perfectly designed for is usage never had a problem and would highly recommend. by coffeeman from Perkasie, Pa.
Can I place the catheter for overnight use? The catheters don't have anything to keep them in your bladder all night. You need one with a balloon, and a syringe that will keep the catheter in place after you insert the fluid in the port on the side,(using that syringe) opposite from where the catheter joins the bag. Keep that little syringe). Then in the morning, withdraw the fluid you had used to keep the catheter in your bladder all night, and just pull the catheter out. They are not meant(intermittent ones)to be used over and over again. You need to see a urologist, whose nurse can demonstrate how to use one overnight.You can learn the correct technique, or else you will end up with repeated infections. Talk with your M.D.!! Good luck! Do you now take insurance thru medicare for your products. Asked on Aug 5, 2012 11:46:17 AM by Ore from Miami, Fl. Unfortunately Allegro Medical does not bill insurance at this time.